Ask fellow campers about "Coronado Campground" and nearby attractions. We usually like city parks both for their convenient locations and reasonable rates. While this park was conveniently located to shopping etc., we thought the rate was a bit high for a city park, although there are different site choices, for example dry camping would've been $14. All the hook up sites were pull-thrus with adobe ramadas and picnic tables. There was good vegetation separation, but the sites were a bit close together and the park road for this section was a little tight. The picture on their website makes the sites seem much more wide open than they are. We had good OATV reception, and the park offered free wifi (which we didn't use.) This park was mostly a stopover for us, but we did have time to visit the Sandia Tramway area for a hike, and if we had stayed longer, we would have visited the adjacent Coronado State Monument. We camped at Coronado Campground in a Motorhome. On ck-in I mentioned we'd not be unhooking our tow vehicle since we would be leaving out early. They realized we might not fit in our reserved spot & offered a free upgrade to longer space that would have cost $5 more. Wonderful service. Spacious spots overall & very clean with great views of Sandia Mtns. We'll return. We camped at Coronado Campground in a Motorhome. WiFi was good. Cell service very good. Easy in/out. Nice covered patio. No sewer at site, central dump. Excellent Mountain View Will return. We camped at Coronado Campground in a Motorhome. Entrance was very difficult to spot due to major construction on the surface street. We missed the turn and it was difficult to find a turn around due to the construction. That said, check in was easy and the spaces were very nice with each space having a covered picnic area. Shared water spigot between two sites which was a bit awkward. No sewer but dump easy to access. Nice walking areas and close to Coronado Monument. We camped at Coronado Campground in a Motorhome. Park was hard to find due only to the road construction and the extremely busy access road, Hwy 550. Once in the park the pull thru spaces were nice. Between the fifth wheel and the truck we needed 50', we fit well. We did not have to disconnect from the truck and we were level in the fifth wheel. There is a nice shelter with picnic table. The bathroom and showers were pretty far from us but there was a path through the brush. Traffic noise and was the only detractor, but we could barely hear it inside the fifth wheel. Two 50 amp and the rest are 30 amp, water connections at these sites. There is a dump station that you can hit on the way out of the park, or before if needed. A few trees in the area and the spaces are not real close to each other. 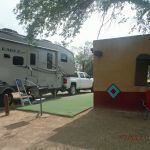 We camped at Coronado Campground in a Fifth Wheel. This camp is at the outer edge of Bernallio on Hwy 550 with easy access to fuel, shopping and casino. This is a beautiful little park next to Coronado State Monument, the Rio Grande river, and a busy highway. All the sites are asphalt pull-throughs. Ours was way out of level. Hookups are power and water, no sewer. They let you empty your gray water on the ground. Surprisingly, they had WiFi which was slow. The bathrooms and showers were clean but run down. I opted to shower in my RV, although I prefer to use the park's showers. This park was nicer when we stayed here ten years ago. The location is excellent. There are views of the Sandia Mountains. Stores and restaurants are around the corner. We caught a free shuttle to the casino next door in order to have dinner. We camped at Coronado Campground in a Motorhome. Former state park now ran by the city of Bernalillo, the park is in need of some maintenance. Water hydrant leaked badly, when I told the park attendent about the leak, his comment was "the trees need the water". Ridiculous high bump strips in the road. The shelters at each site were nice but very dirty inside. Nice shade trees, the park is adjacent to the Rio Grande River. Overall I would prefer this park to other private parks in the area. We camped at Coronado Campground in a Travel Trailer. 1st 6 sites are 50 amp w water pull thru most level and shelter around picnic table. Water is long ways from site. Dump at campground. Rate going to $30 in Nov but 50% off passport America. We camped at Coronado Campground in a Motorhome. Cironado monument 1/4 mi hike $.Santa Anna casino close and nice but no free play automatically. Famous range cafe close and excellent. Can't e,it left out of park (w) due to traffic to get on i25 but just go right to first lite take right and loop around to 2nd light to get out going west. The best things about this campground are: the price, I don't know if this was an off-season price or not, and the proximity to Albuquerque. There are also wonderful views of Sandia Mountain and the Rio Grande which flows right next to the campground. There was good wifi. We tried to use Passport America and were told it would not be accepted until after November 1st. The park could use a serious upgrade. Sites are pull-through but worn out. The one bathroom was ok clean, but the men's room was pretty worn out. My wife said the ladies was in better shape. The campground is right next to a busy street with traffic noise most of the night. There is no gate, so anyone can come and go at any time of day. All in all, a cheaper place near Albuquerque with the basics, but poorly kept. We camped at Coronado Campground in a Travel Trailer. We stayed for a long weekend and enjoyed this campground. It's just a short 15 miles to Albuquerque, and on the edge of Bernalillo. This park is owned and managed by the City of Bernalillo. While the facilities are a bit dated, the park is a delight. Spacious sites are separated from each other by a pavilion-covered picnic table, giving each site added space and a sense of greater privacy. Many sites have shade trees, which help to beat the summer heat. The park is maybe 100 yards off Hwy 550 in Bernalillo, but we never noticed any traffic noise. The Rio Grande River flows just below the campground, with some sites overlooking the river. We were there in September, so the park was very quiet. Some sites are level, some aren't. There did appear to be some full-time residents, but nothing objectionable was noticed. We camped at Coronado Campground in a Travel Trailer. Small park - reservation fee guarantees your site - very peaceful with beautiful views of the Rio Grand River and the Sandia mountains (especially near sundown) - even saw a few roadrunners and jackrabbits. We camped at Coronado Campground in a Motorhome. Santa Ana Star casino & golf course are nearby - shopping is close. We stayed in the dry camping area for three evenings. We pulled straight into space R-8 so we could enjoy the beautiful view of the Rio Grande. We actually enjoyed the dry camping spot better than we did the park with hookups. We would stay here again. We camped at Coronado Campground in a Motorhome. This is a nice, well-maintained city campground about 9 miles north of ABQ. All sites are pull thru with ample space between sites. Each site has its own pueblo style picnic shelter. There are quite a few trees. 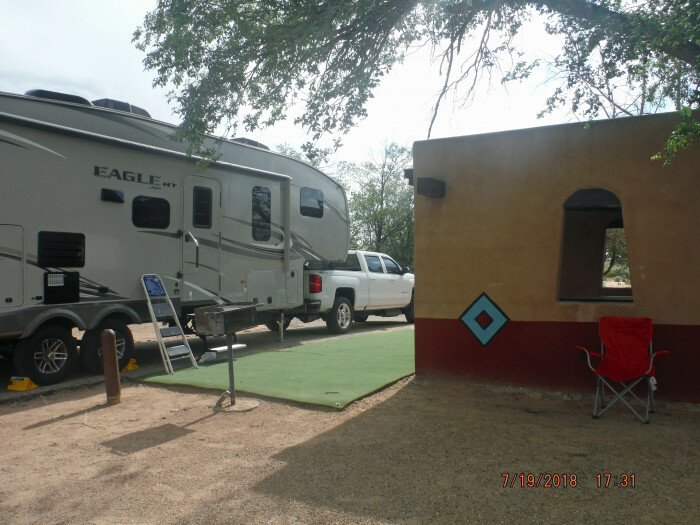 The campground sits on a high bluff overlooking the Rio Grande River (although there's no access to the river) with views of the mountains. We carried chairs over to the empty group site and just hung out enjoying the view. The cg is immediately adjacent to the Coronado Historic site and the Kauau Pueblo. There is also an area for tents or small campers for $14/night, no hookups. The only ding against the park is road noise from the nearby highway - but not a big deal. We camped at Coronado Campground in a Fifth Wheel. Laundromat around the corner has free dryers on Wednesdays. Local shopping very convenient. I had a bad experience and due to this I feel it best to let others know. I had to check in with the camphost and when they saw me drive up and get down to talk to them their dog was not on a leash and he/she bit me! It was very painful and they didn't have any professionalism to check on the severity of the bite, they just took my info and money! What happen to me was dangerous and others can get hurt this is why I am sharing it with you all, so be careful if go to this campground and have to get down to pay. One last thing to add is that the men's restroom had trash all over floor when we got there, urinal had paper towels in it and there was water all over the floor. I picked it up for them because I was to afraid to go tell them cause of their dog! We camped at Coronado Campground in a Tent. Great place to stay. Within walking distance of the casino (about two blocks). Close to all amenities the town offers but you would want a vehicle. If you like craft beer try the Kaktus brewery. Two laundromats east of campground on Hwy550. The cheaper priced Wonder Wash and just as nice is behind Wells Fargo Bank. Wash/dried 8 loads for $13. Car wash another block east or so behind ConocoPhillips Station. $3.25/credit card removed 3 weeks of wilderness dust. Great Mexican at La Salita in Albuquerque north of I-40/Eubank....Costco down Eubank, south if I-40. Recommend the Chile Rellanoes and the Carne Adovada. Sandia Crest, Sandia Tramway, Coronado Monument, railrunner to downtown Sante Fe, old town Albuquerque. Great concrete covered patio shelters with picnic tables made a nice extension to our small trailer. Like an added room! Are you affiliated with Coronado Campground ?